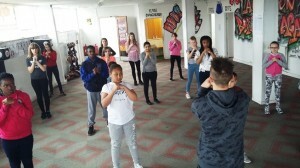 Young People from Allenton are learning dance and performance skills thanks to Allenton Big Local funded workshops delivered by Enthusiasm in partnership with Trinity Warrriors. Since April, around 12 young people have been attending the workshops which are held on Monday evenings. 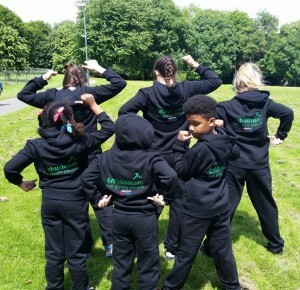 The young dancers performed at the Osmaston Park event in July wearing tracksuits that have been specially designed for the group. Everyone involved was excited to demonstrate their new dance skills to friends and family members and they delivered a strong performance that showed a new-found confidence. By providing regular workshops in a safe space packed with positive role models and activities, the local children involved are being diverted away from more negative encounters and street gatherings that can lead to anti-social behaviour and other problems. · performing in front of other people and strangers. · conducting themselves positively in front of large crowds. · feeling prepared and equipped to cope with an event. · being able to learn new things together with a set deadline. Through dance and performance, the young people are able to express themselves and develop the resilience and confidence they need to cope positively with life issues such as difficult relationships, disagreements and confrontation. They are discovering new, constructive ways to compromise and coming to an agreement that suits both parties. The dancers are currently learning a new routine which will be performed in January at a community event at the Marble Hall on Nightingale Road to celebrate the Rolls-Royce memorial window that has been recreated at the site.